ROCHESTER CASTLE was built in 1937 by Harland & Wolff at Belfast with a tonnage of 7795grt, a length of 474ft 2in, a beam of 63ft 4in and a service speed of 15 knots although she attained 19 knots during trials. Delivered on 29th April 1937 she was the first of a class of four ships which were slightly larger than the earlier 'R' class. She made her maiden voyage to Port Natal on 12th May and was subsequently deployed on the South Africa - UK refrigerated fruit run. Speech Delivered by Dr. Paul Borg Oliver, Mayor of Valletta. On the occasion of the conferment of the title of. Almighty God we give thee thanks...as the simple prayer of all those who stood at the foot of the unbeaten bastions, on the ramparts of the dauntless Fort St Elmo, on the dry shores of the Grand Harbour and on the bare roof tops of the shattered homes in Valletta and the Three Cities as they emotionally greeted the convoy ships sailing in the harbour in the month of August 1942. Minister, colleagues, distinguished guests, ladies and gentlemen. It is a great pleasure and honour for me, as Mayor of Valletta and on behalf of my colleague councillors and all the people of Valletta, to welcome you to Malta on the occasion of the 60th Anniversary of Operation Pedestal. May I point out from the start that Malta`s gratitude and indebtedness to you all and all your colleagues are infinite. The passage of time will never strike off our memory of this glorious event, for your suffering was our suffering and your hopes were our hopes and guided by the noble virtues of courage and, to quote Winston Churchill, "The strength of Malta revived"
I am not a witness to the siege, of course my age gives me away. I have never felt the suffering of hunger, the yelling of sirens, the blast of bombs and the fear of dying out at sea away from my family. These must have been your thoughts and feelings as they must have been of all those who experienced these bitter moments of distress. It appeared that this was the beginning of the end for you and Malta. Yet I am human, so allow me to share with you the grief for all those who died at sea or on land to give me and many others the meaning of life. We stand here today at the St. James Cavalier, the former NAAFI as all of you know it, in remembrance of one of Malta`s most difficult yet glorious moments - a turning point in our history. We stand here today,to give homage to those who gave their lives for others and to honour you, the survivors, of Operation Pedestal for the outstanding noble virtues you have shown throughout your service. During this operation,the Ohio, alone, was singled out, ferociously attacked by the enemy. She was torpedoed and holed, fire broke out, her boilers blew up and her engines failed. She was twice abandoned and twice reboarded. Repeated attempts to tow failed, but the tanker did not sink, Ohio with the help of all the other vessels in the operation shaped the fate of Malta. The ships resistance was equalled by the power of the seamen who, with no time for food or rest manned the crippled ships to port. For everybody, then, it was felt that this was the beginning of the end, this time, of war, of course. Standing battered and bloody, Operation Pedestal and Malta made a great history and paved the way to victory over the forces of the Third Reich. It is for these reasons that the Valletta City Local Government has agreed to confer, for the first time, the title of HONORARY CITIZEN OF VALLETTA to you present and to others in absentia. In 1940 she was placed on a war footing and on 10th August 1942 participated in Operation Pedestal, the most critical of the Malta convoys. Fifteen ships including the tanker Ohio sailed from Gibraltar with vital supplies for Malta escorted by a battlefleet consisting of two battleships, four aircraft carriers, seven cruisers and thirty destroyers. After three days and after being continually attacked by the Axis forces only the Rochester Castle, Blue Star's Brisbane Star and Melbourne Star, Port Line's Port Chalmers and the badly damaged tanker Ohio reached Valetta on 13th August. On the approach to Malta the Rochester Castle was hit in No.3 hold by two torpedoes launched from German E-boats but she managed to reach port, the first vessel to do so. Because of her damage she was forced to remain in Malta until the following December when temporary repairs enabled her to make the dash for Alexandria and thence to New York via Cape Town where permanent repairs were made. In June 1943, duly repaired, she arrived back in Liverpool with a cargo of frozen meat from Buenos Aires. 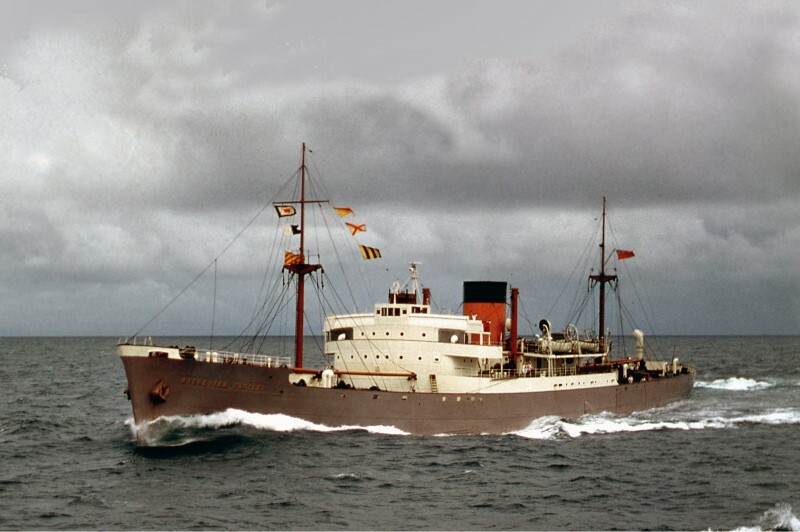 She was sold to Castle Shipping Corp. of Cyprus in 1970 and renamed Glenda for her final voyage to Whampoa where, on 13th November 1970, she was the last of the six 'R's to be broken up.